Even though pictures hardly do the Mattamuskeet and Pocosin Lake Wildlife Refuges near Swan Quarter justice, I will share my stills today and the videos later this week. Stormy promised me this trip for Christmas so that I could see the swans from Alaska that winter on the lakes in this area. 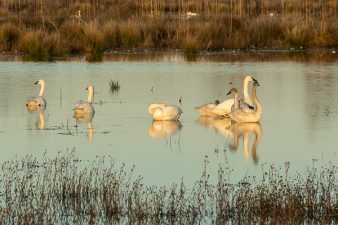 The last time that we attempted to see the wintering tundra swans, we choose an extremely cold and windy day. That weather was good for keeping the swans on the lake (there were thousands and thousands) but terrible for photography as it was difficult to remain outside for more than a few minutes and I was shivering so badly that I could not focus on anything. On this trip the weather was delightful at near 60 degrees and sunny. Apparently swans (like pilots) like to get out and fly on a pretty day so when we first arrived at Lake Mattamusket there were hardly any birds on the water which was quite a letdown based on our first visit. However a quick visit to the visitor center provided the remedy. The kind ranger there handed us a map and gave us quick directions to Pungo Lake where the birds had gone to escape the hunting that had been in process at Mattamuskeet all day. Thank goodness for her info as we saw not only thousands of birds, but also a bear! With courage a human being is safe enough. And without it–he is never for one instant safe.